Purple-leaf plum tree (Prunus cerasifera "Thundercloud") belongs in the family Rosaceae. Trees grow well throughout U.S. Department of Agriculture planting zones 5 through 8A. It is a relatively short-lived tree, living approximately 10 to 15 years. Mature trees reach a height of 15 to 25 feet. Foliage is an attractive reddish-purple, with fragrant, white or pink flowers filling the tree’s canopy in spring, followed by 3-inch purple fruits. Trees are prone to a variety of problems including diseases, fungi and pests. Plum leaf blister (Polystigma rubrum) is an infection purple-leaf plum trees are susceptible to contracting. Red spots that are approximately 8 mm in size cover affected areas of the tree, especially the foliage. Plum trees severely infected by the infection will suffer wilted foliage and leaf drop. Gardeners can spray their purple-leaf plum trees in spring with a fungicide to help prevent the infection. Spray the entire tree’s foliage with a fungicide, being sure to cover the upper and under sides of the leaves. Remove any fallen foliage under the tree’s canopy by raking and disposing of in a plastic bag. Brown rot (Monilia laxa) is an aggressive fungus affecting purple-leaf plum trees. The fungus affects new growth on the tree including foliage, branches, blossoms and fruit. The fungus infects the plant’s tissues causing wilting, blossom and fruit drop. Gardeners can find trees infected with the fungus looking healthy on one day and then, two to three days later, areas of the tree will have turned brown and will be dead. It is best to treat the plum tree as soon as possible to control the brown rot from spreading to other areas of the tree. Trim off all the infected branches and fruit. Sterilize your pruning tools before using them on another plant, so the fungus does not spread to healthy plants in your landscape. Spray the tree with a fungicide, thoroughly covering the entire tree. Puckering (Taphrina) is a disease that affects the fruit of the purple-leaf plum trees. Fruits have stunted growth and shrivel on the tree. 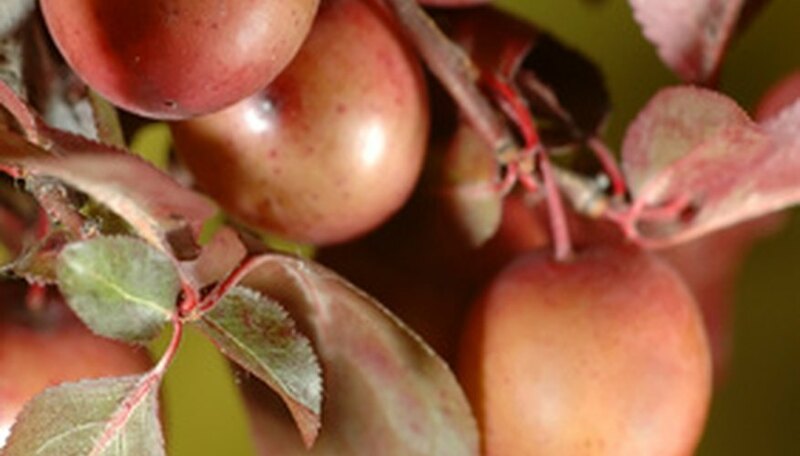 As the disease progresses, plums turn reddish in color and a yellow-gray, powder-like substance covers them. When the disease is severe, most of the fruit will be lost. The disease is sometime confused with the Monilia fungus. When dealing with puckering, gardeners should remove all the fruit from the tree suffering from the infection. Since there are no products approved for use to treat the disease, trees can be coated with a lime slurry in late fall for protection against the disease and possible prevention. For over 25 years, Joyce Starr has owned businesses dealing with landscape & design, lawn maintenance, specialty herbs and a garden center. She holds certificates in landscape design and xeriscaping. Starr shares her passion for nature in her writing, publishing articles on horticulture, outdoor recreation, travel as well as business. Why Are My Peach Tree Leaves Turning Yellow & Brown?